Welcome to the American Daffodil Society Library. The American Daffodil Society has been gathering materials about daffodils over the past 60 years, and we plan to make them available as items are scanned and permissions gained (when copyrights require it). Within the library are links to downloadable PDF files of older books which have been digitized by Google and others. There are more than 4,000 publications, articles, and catalogs available to download and read. Also, there are links to websites with digitized books and materials. 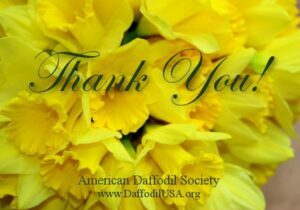 Under ADS Pubs, the four issues of the 2013 American Daffodil Society Journals. ADS Daffodil Show Results (ADS Pubs, Results of ADS Daffodil Shows) – Complete individual 2018 Show Results are now posted. Newsletters from various regions and local groups were posted under ADS Pubs. Several catalogs from 2018, including Esker Farm, Dryad Nursery, Oakwood Daffodils, PHS, and J. Walkers, are now posted. You’ll find a large compilation of daffodil catalogs from growers around the world, some dating back to the late 1800s. Yellow Fever, A Prospect of the History and Culture of Daffodils, 2012, by Dr. David Willis of England, is our first eBook. There is a wide range of articles: some scientific, some about miniature daffodils, some about the health of daffodils, and some about daffodils growing in their native habitats written by those who’ve searched for them over the years. Our own Daffodil Journal is also available, from 1964 thru 2013. This is an ongoing project, and we hope you’ll check back from time to time to see what we’ve added. We’d love to hear from you if you have any comments on how we can make the library more useful to you.